In the beginning skateboard bearings were put together with cup washers molded into both sides of the wheel. Separate balls (8 per side) were then placed inside, then a cone was screwed down the axle and locked off at just the right tolerance to allow the wheel to spin. If your cone loosened too much your balls would fall out and you'd come crashing down. Old school set up, showing balls, cones, lock nut and washer. In 1974 sealed precision bearings were first used by "Road Rider" in their skateboard wheels. The standard size bearing chosen was the 608. This number denotes the size. They also come with other letters, such as ZZ or RR, these letters denote the shield material. "Z" denotes steel and "R" denotes rubber. The reason for two ZZ or RR denotes both sides. So a 608ZZ is a bearing with steel shields on both sides, a 608Z is what are becoming popular these days for cleaning a single sided steel shielded bearing. Though the rubber shields are great too being able to be removed and put back in much easier with less chance of bending or damaging your metal shields in some way so they will not fit back into place. The rubber shields do offer slightly more water protection than the steel. 608Z bearing showing metal shield and cir clip. Bearings are made as sealed, semi sealed or shielded, A sealed bearing has grooves in both the inner and outer rings for the, usually rubber shield to seat into to give it better water proofing qualities. The semi sealed bearing has the one groove in the outer ring and does not interfere so much with the spinning of the bearing. It should be noted though, that when the bearing is put into a wheel and ridden the friction factor really is not a problem of slowing you down. It's only when you spin it in your fingers that they will tend to slow. The last is the metal shield that sits in a recess in the outer ring with a cir clip or crimp ring that clips the shield and holds it into position. The cir clip can be removed but the crimp clip can not. There is all this misinformation floating around about bearings these days, how do you know what you're getting? Is it the ABEC rating or is it the price you should be looking for? Price can be misleading as different brands have many sales channels before they get to you at your local shop. One brand might be sold direct going through less hands and end up rather cheap, and another brand may go through a few more before they get to the shop, so it won't mean it's better just because it is more expensive. Best bet is a local cheaper brand would be as good as a more expensive imported USA brand. Certainly these days bearings are being made far better than days gone by. So a rather cheap bearing is still going to be fine. The ABEC rating is a reference to the tolerance of the components fitting together, the balls and the two rings. ABEC stands for "Annular Bearing Engineering Committee" It is a committee set up over 40 years ago by the American Bearing Manufacturing Association, to set tolerance standards for bearing manufacture industry. These days with better manufacturing techniques many ABEC 1 bearings would actually rate now at ABEC 3. The ABEC scale goes in odd numbers 1, 3, 5, 7, 9. The higher ABEC rating bearing would typically be used in an electric motor or in some sort of aeronautical machinery that would spin at 20,000 to 30,000 RPM hardly what you'd be doing for skateboarding. The problem comes though when you want to turn. Bearings are made for spinning really only on one axis, and not made to handle sideways torque. Greater factors than the ABEC rating are at play as to what makes a good and fast bearing. Firstly the "Grade" of steel they are made of, secondly the "Precision" the bearings are finished with and the "Lubricant" that is used. One more factor that is coming to the fore front these days is different more space age materials, such as "Titanium" and very common now, "Ceramics". 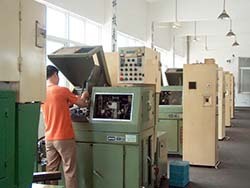 Bearings are generally graded into three grades. "Semi-Precision" "Precision" and "Full-Precision" Bearings. The different grades of precision does have some relevance to the ABEC scale. The "Semi-Precision" bearings are found in your very Low end K-Mart skateboard, basically crap. Low quality steel with hardly polished surfaces. The ball retainers may be made of pressed steel or brass and grease rather than a light oil may be used for lubrication. The "Precision" Bearings are the most common cheaper bearings found. Usually decent grades of steel used and reasonable to good polished surfaces. Still may have pressed brass, steel or plastic retainers. A fine/light grade oil even maybe a synthetic based oil could be used for lubrication. The "Full-Precision" bearings are your high end expensive ones. Highest grade Chrome steel used for rings and balls, highly polished surfaces. These puppies will spin very smooth and quiet, and just keep spinning. The retainers could be made of plastic or nylon, this is a self lubricating material that creates very minimal drag. The oils used would be very hi-tech synthetic based that can handle very high temperatures. Trouble is you don't really know what your getting based on price alone, many "Brands" only rate their bearings in the ABEC scale. The quality of the material they are made of is important. Most good bearings, Precision and Full-Precision should be made of 52100 Grade steel, "Chrome Steel", "Chrome alloy" This material is so hard and will keep your bearings rolling smoother for longer. Cheaper grades of steel will break down faster with grit etc. The "precision" factor also has a lot to do with how the internal faces of the rings and balls are finished. A Full-precision bearing is highly polished, giving the bearing good qualities of being fast, smooth, and quiet. A lower grade bearing will spin with some noise and stop spinning much faster. Don't mix up the fact that a new bearing will have oil in it so it will not necessarily spin fast and long in your fingers when new. In fact if it does it may not have enough oil to start with. Newer materials such as Ceramics and Titanium are now being used. The average Ceramic bearings only use Ceramics for the balls only. 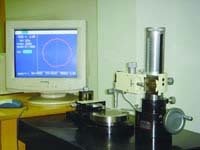 A full Ceramic bearing (rings and balls) is available, but very costly. A normal Ball only Ceramic bearing can costs up to 10 times more than the normal Chrome steel bearing (at the manufacturing cost price), compared to up to 100 times for a full Ceramic bearing. That would make a set of 8 of those babies cost around $2500.00 retail. Even though a set of std bearings would cost about $25, 10X that would make the ceramics retail for about $250, so you can see that the mark up for these higher end bearings is less for the "Brand" not the shop, than the normal Chrome steel bearings, as your good Ceramics can come in at between $100 and up to $150 a set. Good value for money. An other factor to note is the introduction of newer designed types of bearings. The Powell "Swiss" bearings and the new "Oust" Bearings have come from the fact that normal bearings have only ever been designed to spin in one axis and was never designed to have sideways loads placed on them like they do have in skateboarding. It is these sideways loads and to a smaller degree, a build up of grit etc, that ends up "Popping" your bearings. These bearings have a deeper, wider race for the balls to run in. This feature allows for greater sideways loads and can allow for more contaminants to build up before it may affect the bearing, but also allow for easier cleaning. As you can see from all this information it is a mine field out there and who can really know what quality your bearings are. On the outside most bearings look the same. You can't tell if it is polished down to a tolerances of 4 or 6 microns (smoother) or only finished at say 16 microns (coarser). You can know what grade of steel it is made of. The ABEC rating has been used to denote a "better" bearing. A high ABEC rating bearing could be made of low quality steel and polished very little, how would you know. Many companies selling bearings sometimes don't know themselves what quality their bearings are, many manufacturers don't even give details apart from the ABEC rating, and perhaps the materials used such as Chrome steel Ceramic and Titanium, Stainless steel, etc. I hope I've armed you with a little more information to work out what sort of bearings you may buy next time your in your local shop. Price is still a big factor, how much are you prepared to part with, to settle for a reasonable quality bearing. Best indication is testing yourself, you'll soon begin to feel the difference in ride and lasting qualities of particular bearings, as opposed to their price, and you'll have your favourite choice.